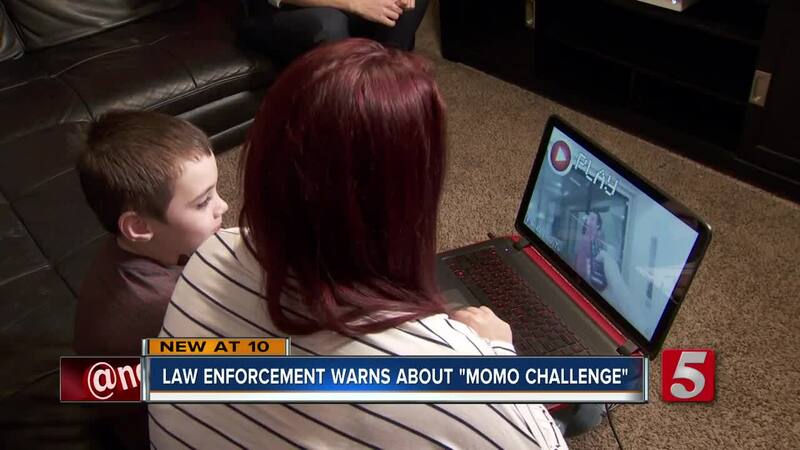 Mid-state law enforcement warning about dangerous "Momo Challenge"
A dangerous internet challenge has mid-state law enforcement urging parents to monitor their kids. LEBANON, Tenn. (WTVF) — A dangerous internet challenge has mid-state law enforcement urging parents to monitor their kids. The "Momo Challenge" has circulated around social media over the last few days. The challenge reportedly uses a creepy image to scare and try and convince kids to do several tasks, including self-harm. Experts say the challenge targets kids through several websites and applications, including Youtube Kids, Facebook and WhatsApp. "First thing that crossed my mind when it came up was it was disturbing,” Wilson County Sheriff's Office Lt. Scott Moore said. On Wednesday, Moore posted a warning onto the Sheriff Office's Facebook page. "Warning to ALL Parents- Beware of the 'Momo Challenge,'" the post read. "In recent weeks, a trend called the 'Momo Challenge' has been linked to several suicides worldwide. Although it has been appearing around the internet for at least a year, we feel that everyone should take precautionary steps to ensure your child is safe while playing such games as Fortnite or kids show character Peppa Pig due to the latest unfortunate events." Moore said he wanted to post about the challenge to urge parents to keep an eye on their kids' screens. "Be vigilant on social media, monitor your kids activity on social media, on the iPhone and be the parents you're supposed to be," Moore said. Moore added that the vigilance should keep up after the "Momo Challange" dies away, because it will be replaced with another internet challenge.